We currently do not have any albums listed on our website for James Goforth. If you know of any album we are missing for James Goforth, please contact us via email. James is a guitarist/songwriter/singer, who has been playing guitar since he was a young teenager. 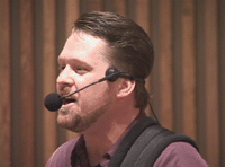 In 2000, James established Cross Strings Ministry as his full-time ministry. Preceding his decision to enter the Christian music field, James went on a mission trip to Romania and a three month tour in the USA and Europe with the Continental Singer’s presenting “David, A Man After God’s Own Heart." Since dedicating his talents of playing guitar and composing, he has given his gifts to spread the gospel of Jesus Christ through music to wherever God leads.